Bigger is better, right? 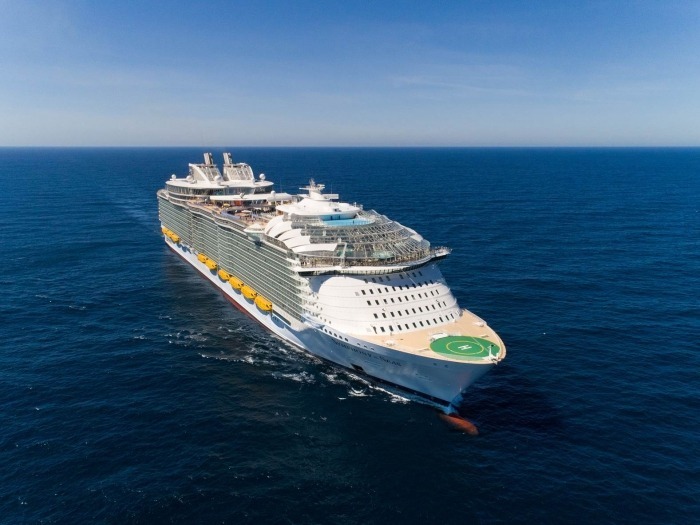 For those booking a cruise on the brand new Symphony of the Seas operated by Royal Caribbean, you’re about to sail on the biggest cruise ship ever made! 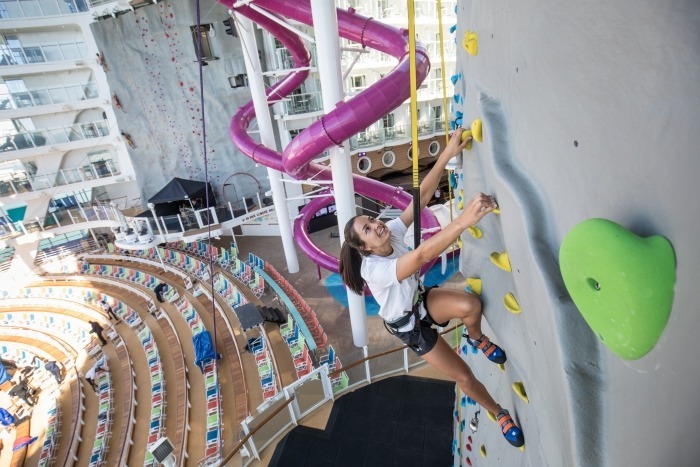 Not only does Symphony of the Seas tower above the rest, the amenities, restaurants and activities for all ages make it one of the funnest cruise ships we’ve ever experienced! Come aboard with us and read our Royal Caribbean Symphony of the Seas cruise ship review! As the world’s largest cruise ship by gross tonnage (22,021 tons), Symphony of the Seas is quite simply massive. 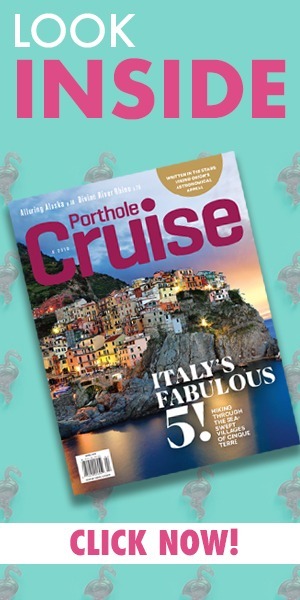 Built in France, the ship was completed in March of 2018 began sailing with passengers later that year. She follows along with the previous Royal Caribbean Oasis-class ships in terms of design, but with many features unique to the ship. Big enough for a water park, a full-size basketball court, ice-skating rink, two rock climbing walls and a whole lot more, the 5,518 total passengers on board can sail for a week or more and still discover new and exciting things to try and explore, including seeing all 20,000 tropical plants in the ship’s ‘Central Park’. We mentioned some awesome activities above, but there’s a whole lot more to do on this ship than any other! Challenge your friends and family to a game of glow in the dark laser tag before heading over to Playmakers Sports Bar and Arcade for a bite to eat. Looking to catch a wave? Symphony of the Seas has two FlowRider surfing simulators so you spend more time hanging ten, not waiting in line. 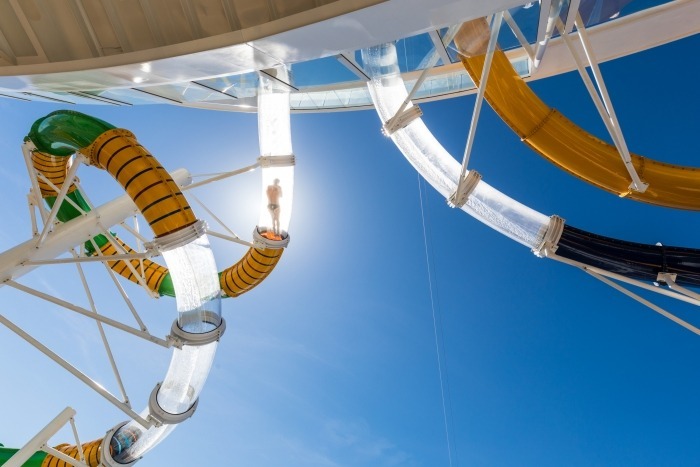 Speaking of water parks, the ship also has the tallest water slide at sea, Typhoon and Cyclone, which pit passengers against one another in a race to the finish! The entertainment options are unique as well, with popular shows like Hairspray and the thrilling AquaTheater, there’s always something new to see. 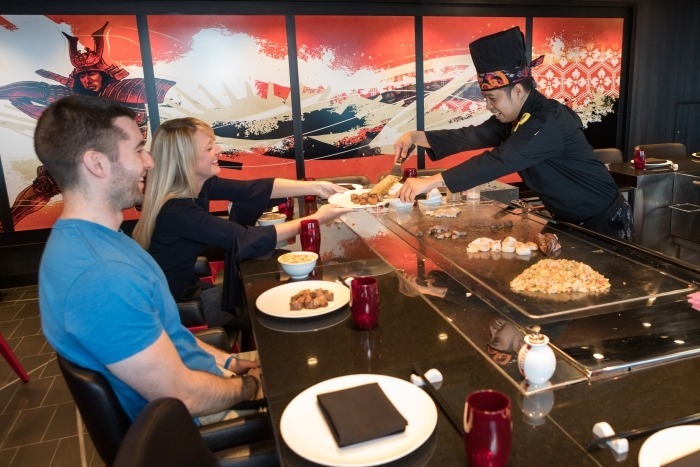 After a long day of riding waves, shooting hoops, swimming and more, it’s time to enjoy one of the many dining venues on board Symphony of the Seas. The main dining room offers world class cuisine with a new menu each evening to keep your tastebuds guessing. Those looking to enhance their meal should try one of the many speciality restaurants like Jamie’s Italian by Jamie Oliver or Izuma, an exotic Asian-inspired restaurant all sushi lovers will enjoy. Chops Grille is the best place on board to get a quality piece of meat prepared by experienced chefs. Surf and turf, anyone? Another popular feature of Symphony of the Seas is the many bars and lounges offering unique drink menus and all your favorite themes like Schooner Bar, English Pub, Boleros, and the Diamond Club for Pinnacle Club Crown & Anchor Club members. Even the interior staterooms on the brand new Symphony of the Seas impress, so it should come as no surprise that the ocean view and balcony rooms, all the way up to the suites, are some of the most comfortable and inviting at sea. Each room includes access to room service, baby-friendly features, turn down service, in room wifi options and much more. 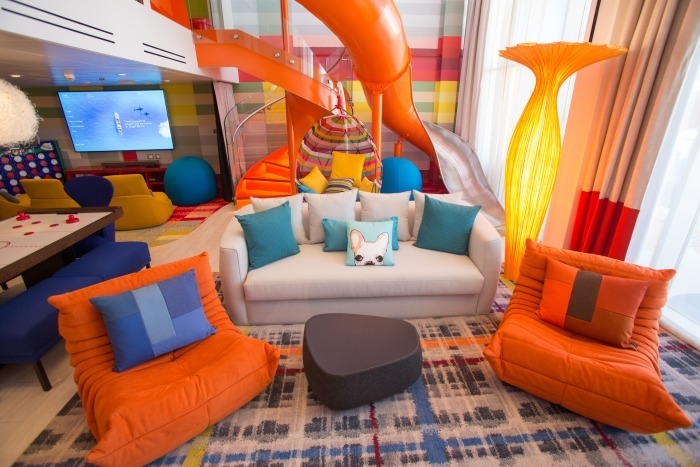 The “Ultimate Family Suite” might be the single funnest stateroom at sea. Featuring 2-bedrooms in a loft design, an air hockey table, a lego wall, slide from the top level, swinging chairs and more, this suite is an incredible vacation room for kids and parents. Our view? 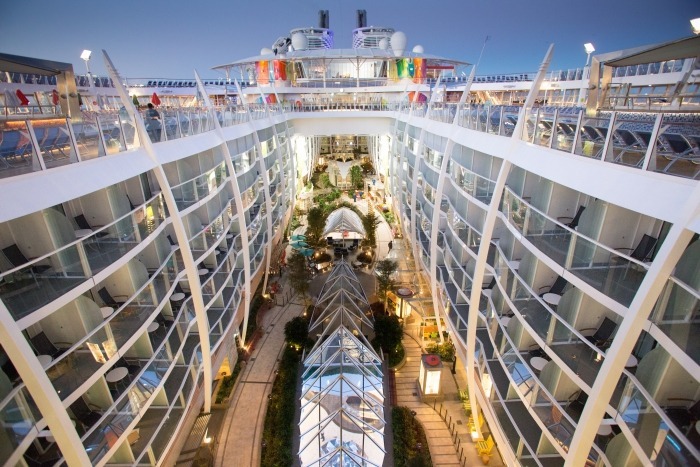 Royal Caribbean Symphony of the Seas is a top of the line cruise ship and anyone with the chance to cruise on it should jump at the chance!